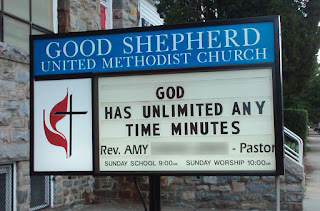 "God has unlimited any time minutes"
The intended meaning: You can talk with God whenever you want, for free. I suppose the intended point on this one could just be that God can talk to you whenever he wants, but it does make it seem awfully one-sided. Suggestion: replace "God" with "prayer." Then it gets your message across, and the only problem is trying to sound painfully "with the times." "The tea kettle sings even when it's up to its neck in hot water"
The intended message: Try to be cheerful, even in the midst of suffering. The problem: First off, yes, this is the flip side of the previous sign. That was a good day. You'll be seeing more of this church in the future. To the point, though. This is a message I actually agree with. It's secular, for one, and about looking on the bright side, which I like. More importantly, however, it shows a rather shaky grasp of how tea kettles work. If you're submerging them in hot water instead of filling them up and bringing them to a boil, you're doing it wrong. And they don't sing even when hot water's involved, they sing only then. 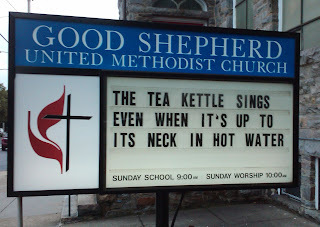 Really, the whole thing should read "The tea kettle sings only when it's full up with hot water." Unfortunately, that makes the message sound more like an "Art must come from internal torment" kind of thing, which I don't think is what they're going for. Credit where credit is due, though, they managed to use both "it's" and "its" correctly in a sentence, even if they did have to get creative and use an inverted comma in place of an apostrophe in order to do it. "The Holy Spirit blows today"
The problem: Okay, look. I said I wasn't going to pick on unintentional double entendres. And I'm not. But really, really, I'm having a hard time seeing this message as anything other than inappropriate. I'm not by any means a theological expert, but is the Holy Spirit known for... blowing? I mean, it's not like it's the Holy Wind or something. 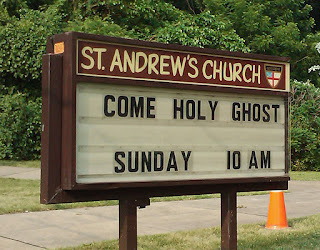 Is it supposed to be like "The Holy Spirit moves through you today"? Or like "The Holy Spirit is... traveling around...." I don't even know. Does... does nobody check these things? Because even ignoring the obvious that's-what-she-said-edness of this, I can't think of any way to parse this other than the same way I would the sentence "The Orioles blow this season. "* Which, again, I don't think they're going for here. And that's it for this go-round! See you next time on "Over-Analyzing Church Signs"! *What, I can't make a sports reference?